Slice peeled potatoes with a mandolin or with a sharp knife into thin, even slices. Set aside into a bowl of water to prevent potatoes from browning. In a skillet over medium high heat, add the beyond burger patties. Crumble with a wooden spoon into small pieces. Cook, stirring occasionally, for 5-7 minutes. Remove beyond burger from the skillet and set aside in a bowl. To the same skillet, add the vegan butter and melt. Add the flour, and whisk until thoroughly combined. Add the almond milk, continuously whisking to develop a roux. When the roux is bubbly and thickened, turn off the heat. Stir in the salt, pepper, thyme, and dijon mustard, and mix until combined. Add the vegan cheese and continuing stirring until cheese is melted and combined. To get a smoother sauce, pour the sauce into a high speed blender and blend until smooth. 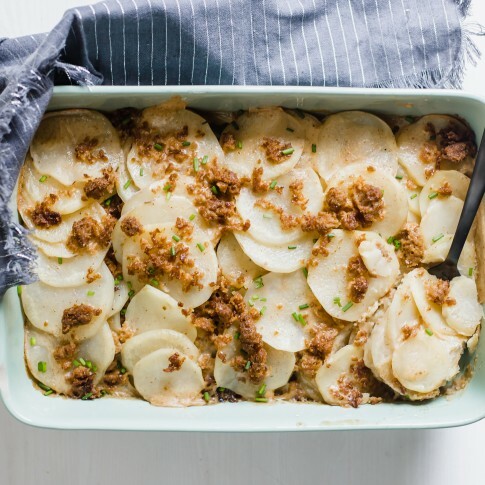 In a 9×13 baking dish, layer 1/3 of the potato rounds in a single, even layer. Top with 1/3 of the cheese sauce and 1/3 of the beyond burger. Repeat the layers until all the ingredients have been used. Cover with foil and bake in the preheated oven for 1 hour and 15 minutes. Remove the foil and bake for an additional 15 minutes.